Like most people I think, I’m a creature of habit when it comes to morning rituals. I will always have breakfast and most likely oats. Whether it’s a steaming bowl of porridge or a mix of homemade granola, yoghurt and fruit. Caramelised bananas are just divine and will instantly give your breakfast a little bit of wow factor whilst being utterly delicious! I have added a touch of cinnamon and vanilla to this version but the bananas are really tasty without either too!! Melt the butter or coconut oil in a frying pan over a low heat. If using coconut oil, add a pinch of sea salt to add the salt that is traditionally in Irish butter – it will really enhance the end flavour!! Stir in the honey, cinnamon and vanilla to combine. Cut the banana into rounds, add to the frying pan and increase the heat to medium. Flip over to coat in the sauce on both sides, turn the heat back down to low and allow to cook through for 5 minutes. Remove from the heat and enjoy! Hope you enjoyed this recipe! Want to stay up to date with all my latest recipes and creations then join my mailing list now. Click here to get my latest newsletter! Get your copy of the DELALICIOUS – A Full Plate For A Full Life cookbook here! Remember to add #Delalicious to all your cooking, baking & treat making on social media posts. 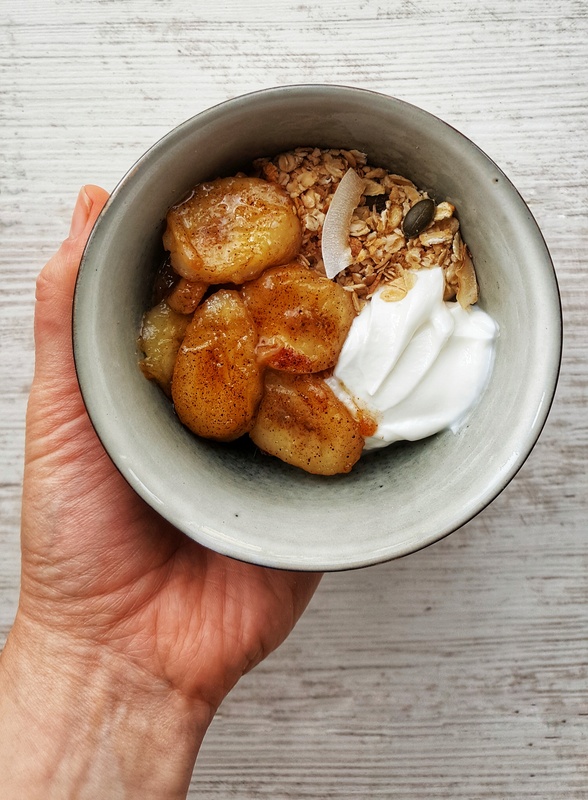 Caramelised Bananas - Delalicious on The Best Way To Start Your Day!! Let's Talk Food & Sport With…. You can change your mind at any time by clicking the unsubscribe link in the footer of any email you receive from us, or by contacting us at sinead@delalicious.com. We will treat your information with respect. For more information about our privacy practices please visit our website. By clicking below, you agree that we may process your information in accordance with these terms.